Shoot up to 20 feet with this adorable bunny! 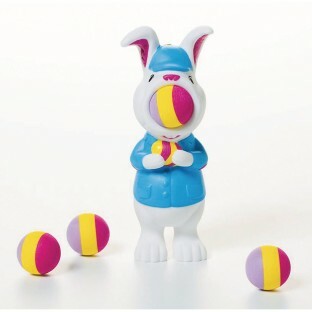 Simply place a soft foam ball in its mouth, squeeze its belly and watch that ball fly! Get into some popping action with the bunny popper! Shoot up to 20 feet with this adorable bunny! Simply place a soft foam ball in its mouth, squeeze its belly and watch that ball fly! Air powered - the harder you squeeze, the further it shoots. Safe for indoor and outdoor play, this bunny provides heaps of popping fun! Store all six foam balls in the convenient carrying net and never lose a single one. Try hitting a target or seeing how far you can shoot.